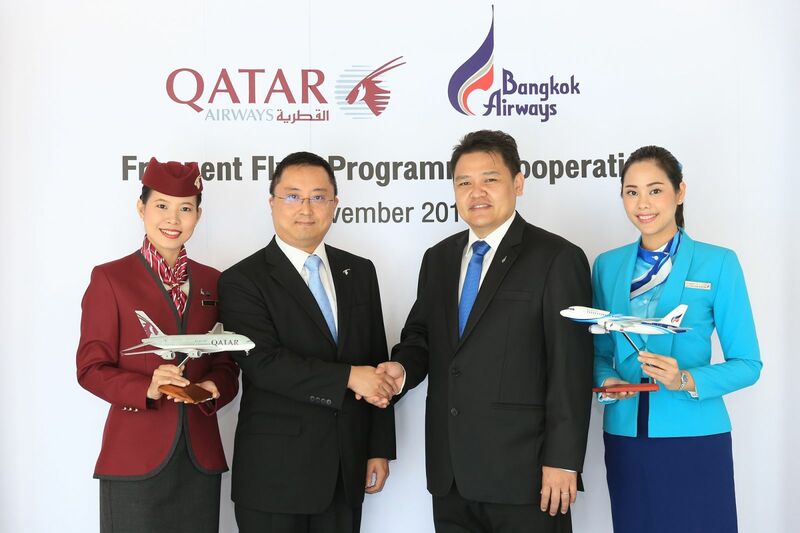 BANGKOK, Thailand, 2017-Nov-10 — /Travel PR News/ — Bangkok Airways Public Company Limited is pleased to announce the launch of its frequent flyer programme partnership with codeshare partner, Qatar Airways, starting 1 November 2017. Bangkok Airways FlyerBonus members can earn and redeem FlyerBonus points on eligible Qatar Airways flights. FlyerBonus is the frequent flyer programme of Bangkok Airways, offering exclusive privileges and benefits to its members including premium lounge services and generous baggage allowance. SOURCE: Bangkok Airways Public Co.,Ltd. This entry was posted in Airlines, Flights, Travel, Travel Marketing, Travel Services, Travelers and tagged Bangkok Airways, frequent flyer programme, Mr. Ehab Amin, Mr. Jirapon Hirunrat, Qatar Airways. Bookmark the permalink.